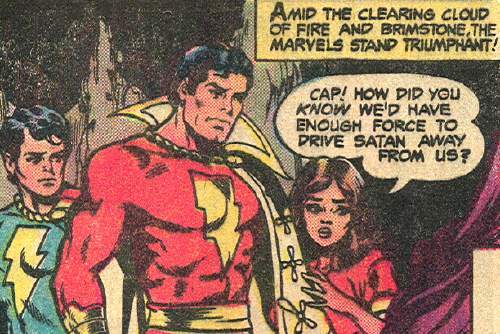 And now…things you don’t tend to hear the Marvel Family say any more. § February 4th, 2009 § Filed under big red cheese Comments Off on And now…things you don’t tend to hear the Marvel Family say any more. I love the Don Newton-era Shazam! stuff, but darn if they weren’t a bit peculiar. I mean, even by usual Captain Marvel standards. At one of my favorite blogs, Armagideon Time, Andrew has a few words to say about Final Crisis and the nature of event books. It’s another thoughtful and critical take on FC that’s well worth your time to read. Two links to Kevin, not that the boy needs the traffic but hey, these made me laugh: first, seriously, I was in on the events that eventually resulted in this image, and Kevin’s right…don’t ask; second, the URL may not be work-safe, but I think it’s safe to assume this was the subtext of pretty much every Star Trek episode. Well, shucks. Thanks, Mr. Bubblegum!